This business centre is situated near the O4 transit road from Istanbul to Ankara. 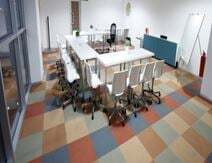 Offering fully furnished offices, virtual offices, business lounge and meeting facilities, this centre is ideal for a range of business types and sizes. There are events spaces nearby where you can host conferences and conventions, as well as many sports facilities within walking distance where you can stay motivated.